Dealing with the problem of lightning strikes was of concern long before electronic equipment needed to be protected from its effects. (Before I forget to mention it, Mac introduces Barney to the Zener diode in this 1963 saga) Fires that were the result of lightning have always been a problem in nature, but they were really catastrophic to civilization once cities crowded with close-quartered wooden buildings became the norm. Benjamin Franklin observed that when the many lightning-induced fires of Philadelphia were sparked (pun intended), it was almost always the tallest structures in the area that were hit. Those fire often spread to neighboring buildings and burned down entire city blocks. It was a devastating and frequency occurrence. Having deduced from his famous kite flying experiments that lightning was a form of high voltage, high current electrical discharge*, he came up with the idea of erecting a conducting post to the highest point on a structure and connecting it to ground. Once Franklin's 'lightning rods' were installed all over the city, fires were rare. Out of an abundance of caution, I have secondary surge arrestors on all my electrical outlets and a primary whole-house surge arrestor wired into my circuit breaker panel. Thus far none of them has ever been triggered, but I never ley my guard down (literally). I also have them on the coaxial cable and telephone line entry points. To really illustrate the degree of overkill I like to employ, I installed a surge / brownout protector on the A/C compressor. Surge protectors are a small price to pay compared to the potential loss of a computer, television, radio, refrigerator, or other device. * Contrary to the believe of many low-information people, Franklin did not 'invent electricity.' Also contrary to the belief even of some who know Franklin did not invent electricity is that a lightning rod's purpose is not to invoke a lightning strike, but to prevent it by lowering the difference of potential between the cloud and the rod, thus preventing a corona discharge. Mac and Barney discuss the frequency, amplitude, dangers, and control of random voltage surges as a storm rages outside. It was a hot, muggy, July afternoon. Even before lunch Mac and Barney had noticed characteristic lightning-caused flashing on the screens of the TV sets on which they were working, and now at one-thirty the sun disappeared behind dark anvil-shaped clouds towering in the southwest and the earth shook with the growl of distant thunder. 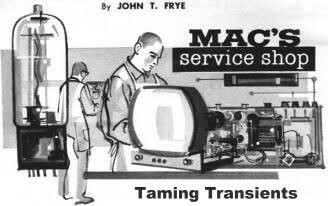 "That does it," Mac said as he pulled the big switch that completely disconnected all test equipment and service bench outlets from the line. "I know this will probably break your industrious heart, but we'll take a break until the thunderstorm passes. Lightning-induced voltage surges are not going to get my service equipment, me, or my valued assistant if I can help it." "Gee, thanks!" Barney retorted as he tilted his stool on two legs so that his back could rest against the wall; "I notice you listed things in the order of their importance." "Yes, how about that?" Mac said with a teasing grin. "You know I've always been a little hipped on the subject of how lightning damage can ruin electronic equipment, and I'm even more so after reading a short article that appeared in the March, 1963, issue of 'Newsletter,' published by the Rectifier Components Department of General Electric." "You don't need to sell me on the danger," Barney sniffed. "I've seen too many radio and TV sets on the bench that had been clobbered by lightning that 'came in' over the owners' light lines. That stuff sure is freakish. Sometimes it skips all over a set blowing tubes, burning out coils, breaking down the insulation of transformers, and even fusing the plates of a tuning capacitor together. Again it only pops the line bypass capacitors, but what a job it does on those! I've seen dozens of cases in which all that's left of the line bypass is the two wire leads with little disks on the end that originally connected to the foil. The capacitor itself is entirely gone except for a few shreds of foil and paper splattered against the flame-smoked chassis. Those surges must really pack some voltage." "That's pretty evident, and I've always wondered just how much voltage, but I never had equipment suitable for measuring the amplitude and duration of the surges. The boys at G-E's Advance Technology Laboratories in Schenectady apparently got to wondering, too, and they had the equipment. 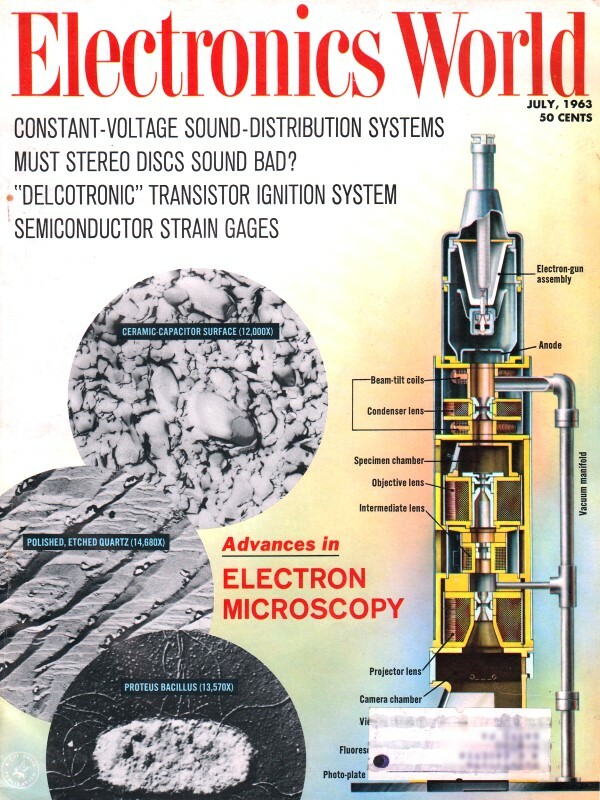 Their transient measuring set-up used a Tektronix automatic oscilloscope and a Beattie & Coleman automatic camera. Every time a transient came along it was displayed on the scope and its picture was automatically taken to indicate the peak-to-peak voltage amplitude and the duration. With this kind of equipment set up in various locations in two different states, 8000 hours of testing time was logged at the time the article was written. The tests are still going on." Mac stopped speaking, and the thunderstorm hit with roaring wind and sheets of rain splashing against the windows. The thunder was almost continuous. "You say the equipment was set up in 'various locations.' What kind of locations?" Barney wanted to know. "All the tests were made across 120-volt lines, but since voltage surges are produced by a wide variety of causes, varying all the way from bolts of lightning striking near the lines to different types of electrical apparatus being connected to and disconnected from the lines, it was decided to monitor a number of locations in order to photograph a wide range of transients. To this end the equipment was set up in seven private homes, two hospitals, one hotel, one motel, and one department store. Results showed the wisdom of this deployment, for some locations had considerably more and higher transients than did others. Equipment that probably would have operated without injury on some of the lines would very likely have suffered transient damage on other lines." "What was the highest voltage surge measured?" Before Mac could answer, there was a terrific flash of lightning accompanied by a sharp snapping sound followed almost immediately by a crash of thunder. The lights in the shop flickered momentarily. "Whew! That was a close one!" Mac said as the unmistakable odor of ozone came in the open door. "I think it was trying to answer your question, for the highest transient measured on a 120-volt line was one that reached 3740 volts peak-to-peak, and this occurred in a Florida home during a lightning storm. That's the kind of surge that pops those line capacitors you were talking about. A voltage of that order can easily hop across the closely spaced contacts of an open line switch in a radio or TV receiver; so just turning the set off during a thunderstorm is no insurance against lightning damage. Pulling the plug during the storm is the only way to be sure lightning can't get at the set via the power line." "I'll buy that," Barney agreed emphatically. "I keep all the plugs of my ham equipment pulled when the station is not in use, especially during the thunderstorm months. More than one of my ham acquaintances has had his entire station wrecked by a single bolt of lightning that struck near the power line feeding the station. While most hams are not stupid enough to operate during a thunderstorm and are careful to ground the transmitting and receiving antennas, a lot of them leave the back door unguarded, so to speak, and forget that lightning damage is much more likely to arrive via the power lines than it is to come in over the antenna. What else did the G-E boys learn from their surge survey?" "Well, they found relatively frequent transients occur up to 1600 volts, but the most common ones fall in the 500-600 volt bracket. Most of the voltage surges last less than fifty microseconds." "Offhand I'd say the presence of these voltage surges on the line is a more serious threat to modern semiconductor apparatus operating from the line than it is to vacuum-tube apparatus," Barney suggested. "Take for instance two radios that use the same tube line-up except for the rectifier. One uses a half-wave vacuum-tube rectifier and the other uses a germanium or silicon diode. Both rectifiers are fed directly from the line so that any transient appearing on the line appears across the rectifier. I've got a hunch the semiconductor would be more likely to suffer damage than would the tube." "Speaking of ordinary semiconductor rectifiers, I'd go along with your hunch," Mac agreed. "The reason semiconductor diodes are sensitive to transient damage is not too hard to grasp. While a typical 12-ampere silicon rectifier of the conventional type can momentarily dissipate 1000 watts of heat in the forward conduction direction of current, it will be permanently damaged by only a few watts of power dissipation in the reverse or blocking direction." "In the forward direction the current and its attendant heat losses spread out uniformly over the entire silicon junction area, allowing the rectifier to take maximum advantage of its cooling mechanism and heat capacity. However, under the influence of even a brief voltage transient, the rectifier leakage current driven by a momentary high blocking voltage peak will find some tiny flaw or weakness in the junction at which to concentrate. Such weak spots usually occur at the junction surface where the rectifying junction emerges from the silicon pellet. At these microscopic spots a fraction of a watt of concentrated heat may be enough to destroy the blocking properties of the rectifier, no matter how big it is." "I notice you keep saying 'ordinary semiconductor rectifiers.' Is there another kind not so easily damaged by voltage surges?" "Yes. The controlled avalanche silicon rectifier, such as G-E's Model ZJ-218, can dissipate about as much heat in its reverse as in its forward direction. This is accomplished by making the high reverse energy dissipation take place in the avalanche breakdown, or zener, region of the diode characteristic. You know this zener behavior characteristic of a silicon diode permits it to be used as a voltage regulator. As long as you stay within the thermal limitations of a zener diode, it will maintain virtually constant voltage across itself regardless of the avalanche current through it. No damage will result from true avalanche action to a diode with a uniform junction. "A rectifier diode with uniform avalanche breakdown taking place at a voltage below that at which local dielectric surface breakdown occurs can dissipate hundreds of times more reverse energy caused by transient high voltage than one in which the surface breakdown point is reached before avalanche current starts. Once the avalanche current begins, it holds the voltage down so the level where surface damage to the rectifier might occur is never reached. Such a device has its own 'built-in' transient voltage suppressor." "How do you go about making a controlled avalanche silicon rectifier?" "There are two important steps: 1. You control the geometry of the junction surface very precisely to reduce the voltage gradient at that surface and make it capable of supporting high voltage. 2. You carefully control the impurity concentration determining voltage at which avalanche occurs so that avalanche always begins below the voltage where surface damage might be encountered. "Is such a rectifier similar in other ways to an ordinary silicon diode?" "Generally speaking, yes. The CASR's big advantage lies in its ability to cope with high reverse currents. Its forward current handling ability is very similar to that of a conventional diode. However, the high degree of surface stability should payoff in increased reliability. Also CASR's can be operated in long series strings at very high voltage without the use of voltage equalizing resistors, since each cell can be operated in its avalanche region without damage. Voltage safety factors can be greatly reduced. Instead of the usual 2:1 or 3:1 safety factor between rectifier peak reverse voltage and steady-state line peaks, CASR's can often be applied with little or no safety factor. A 1200-volt p.r.v. CASR can be used instead of a 2000-3000 p.r.v. conventional rectifier." "Sure sounds like they'd be a natural for use in the high-voltage power supplies for table-top kilowatt linear amplifiers now becoming so popular with SSB hams," Barney said, cocking one ear to the sound of the storm. "Sounds like it's coming back," he observed, settling comfortably back against the wall. "I just was thinking we could be working on that stack of transistor radios with the v.o.m. 's without any danger of the big, bad lightning getting to us," Mac said, standing up. "On your feet, Buster!" "Your trouble is you think too much,"